What is a ‘snap-release button’ and how does it work on Glaro Inc. smoking receptacles? Dealers and facilities maintenance personnel are attracted to Glaro Smoker’s Post products because of an easy to use snap-release button. 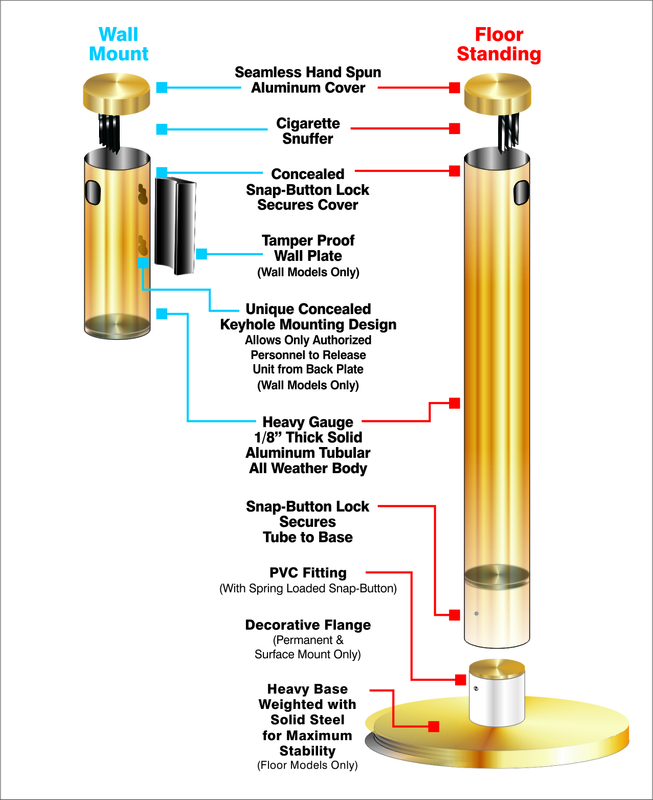 A snap-release push button is a special mechanism (see graphic to the LEFT) that secures the cap to the cigarette tube (on all models) and the cigarette tube to the base (on floor models). With this spring button, the units can be emptied and replaced quickly. The mechanism enables the parts to remain securely attached to one another despite movement and all weather conditions. After servicing, the parts easily align and snap back in place. Floor Standing Models: On floor standing models of Glaro Inc. Smoker’s Posts, one snap button secures the cap to the tubular body. 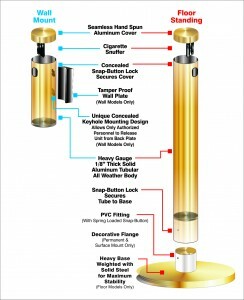 The second button located at the bottom of the tube is provided so that the tube can be removed from the base, making it easy to empty debris. Wall Mounted Models: On wall mounted models, one snap button secures the cap to the tubular body. A concealed keyhole design enables the body to be removed from the wall bracket with a ‘slide and twist” motion. Once removed, the tube can be emptied. This also provides an added level of security. Optional security cables are available that attach the cap to the body and the body to the wall mounting bracket. This helps prevent theft and vandalism. These security features have helped make Glaro’s wall mounted smoking receptacles popular for use in building entranceways, Universities and unattended outdoor areas, for example. Wall mounted smoking receptacles are also an excellent value and are often used in conjunction with Glaro’s floor standing models. In sum, the engineering behind design is essential to the functionality and performance of the post you use. Snap-release buttons and keyless security features help make cigarette disposal easier and worry-free for janitorial staff and management. For more information on Glaro Smoker’s Posts, visit http://glaro.com/smokers.htm today.